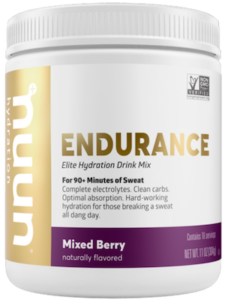 Nuun Endurance is a new product with the same old problem as most other hydration drinks, it’s virtually all sugar! 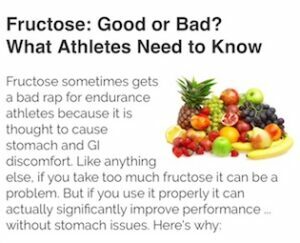 e-Fuel is low in sugar and high in complex carbs, read on to see why this makes a huge difference. e-Fuel uses a proven combination of maltodextrin (complex carbohydrate) and fructose, which research has consistently shown to increases carbohydrate transport and total available energy compared to products like Nuun Endurance without fructose. For additional details read this article. Like Nunn Endurance, e-Fuel uses all natural flavors, colors and sweeteners. e-Fuel is designed to provide complete and balanced electrolyte replacement that is critical for proper hydration and to avoid muscle cramping and injuries. The sodium and potassium levels in e-Fuel are designed to meet the American College of Sports Medicine’s recommendation for electrolyte replacement during intense athletic activity. Citrates assist in the carbohydrate to energy conversion process as well as reduce and slow the build-up of lactic acid in your muscles. Both e-Fuel and Nuun Endurance provide citrates. Nuun Endurance does not have the antioxidants found in e-Fuel.